Korea is probably one of the few countries in the world where classical musicians can become household names. Here, the name Sunwoo Yekwon elicits the response, “Ah, that young pianist,” even from those unfamiliar with classical music. The 28-year-old pianist, who will turn 29 next month, is a star not only onstage but on television as well, starring in a popular series featuring the lives of several Korean celebrities who stay abroad. Sunwoo, however, is no overnight sensation. Before clinching the gold medal at last year’s Van Cliburn International Piano Competition, he had competed in numerous competitions. The Van Cliburn was his eighth win and his last; Sunwoo, who previously explained that he entered competitions out of financial necessity, declared that he would not participate in any more piano competitions. The Van Cliburn prize carries a cash award of $50,000, among other benefits. Sitting across Sunwoo at a coffee shop in the basement of the Seoul Arts Center on Jan. 12, I asked if he is as goofy as the JTBC show makes him out to be. “There is that aspect to me but I could also be particular,” said the pianist. From his youngish, boy-next-door looks it is hard to imagine him as a difficult person, but I quickly remembered that we had to move a few times around the coffee shop to find a suitable spot for the interview. The first table was right under a speaker and even after the staff at the shop offered to lower the music volume, we moved to another spot, away from the sound of music and espresso machine. “I am sensitive to noise, for example,” he said. Surely, artists should be allowed to be particular, sensitive; after all, we shouldn’t expect them to create extraordinary art while being ordinary. But Sunwoo is no diva. “I know the efforts of the staff that go into creating an optimal condition. So, while I am sensitive about my own performance, I am more relaxed about the situation surrounding the performance,” Sunwoo said. Sunwoo began learning the piano at 8 years old, tagging along with his sisters to a neighborhood piano hagwon, or private piano school, where a teacher spotted his talent and encouraged him to pursue music. He attended the Yewon School, an arts middle school, and left Korea to attend the Curtis Institute in Philadelphia, the US, during his first year at Seoul Arts School, to study with Seymour Lipkin, with whom he would continue to study with for six years and from whom he learned to think about the composers’ intentions. Since then, he has earned his master’s at The Julliard School and artist diploma at the Mannes School of Music. Currently, he studies in Hannover, Germany. Timid and shy as a youngster, Sunwoo was anxious about the language problem but otherwise embraced the opportunity to study in a different country, just as he enjoys his nomadic life today, performing in concert halls around the world. He had more than 100 engagements last season, but the travels don’t tire him, he said. On the day of a performance, Sunwoo runs through the recital program, and if it is an evening concert, takes a 20-30 minute nap in the afternoon. “Right before going on stage, I apply hand cream, leaving out the finger tips, because my hands are very dry,” he said. Looking at his hands, he remarked that he likes German composers and that he has hands that are suitable for that type of music. His hands -- which seemed like a hummingbird’s wings flapping furiously to hover midair in a YouTube clip of his performance of Franz Liszt’s Grandes etudes de Paganini S.141 -- look strong and sturdy in person. 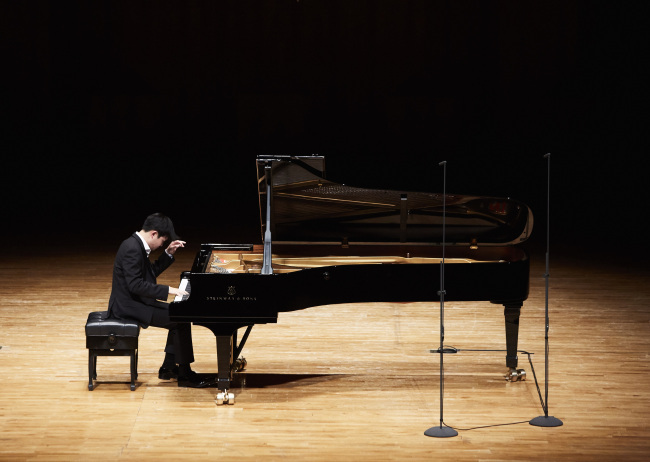 Last year was a particularly hectic one for Sunwoo, who found himself inundated with new concerts and recitals following his Van Cliburn win in June. He kept his existing commitments while taking on additional engagements as people clamored for a chance to hear the new, young sensation. For the 2018 season, Sunwoo is preparing a new program that will include Schubert. “I like Schubert’s music. They may sound simple and monotonous, but for a musician, music of the ‘king of lieder’ feels as if they flow naturally like water,” he said. Although the composer, who died young at 31, had a tragic life, he felt happiness in life, Sunwoo pointed out. “His music shows pain and happiness. There is a lingering emotion. Even a melody that sounds optimistic, leaves you a serene sadness,” he said. The advantage of living in Europe, in Germany in particular, is that he can experience the kind of life that composers led -- he favors late Classical-Romantic composers -- and also have varied experiences. He also appreciates that Europe is conducive to taking long, quiet walks. “I enjoy solitude,” said Sunwoo who typically seeks quiet time alone after a performance. “It is essential for recharging,” he said, adding that he likes taking long walks by himself. Beethoven is known to have taken long, solitary afternoon walks through the forests of Vienna. Are there are disadvantages for performers who come from countries that do not share the Western classical tradition? “One cannot avoid such prejudices,” he said, adding that those views are changing now. Despite his relatively young age, Sunwoo is a disciplined musician. He feels an urge at times to interpret in his own way pieces he frequently performs. “At such times, I review the score and try not to go outside of it. One should be free within the frame of the composer’s thoughts,” he said. “I could perform with total abandon, but it is the role of the performer to play within the (intentions) of the composer,” he added. “A performance flows better when I pore over the score,” he said. As such, he devotes a lot of time to understanding the structure of each piece that he performs. The classical musician also listens to popular music. “Lee Moon-sae, Park Hyo-shin, Chang Hye-jin, Lee So-ra,” he said without hesitation, naming iconic Korean pop balladeers. “Strangely, I don’t hear the lyrics most times, just the melodies,” he said. He listens to Lee Moon-sae on trains and suggested a particular song to listen to on my way back to the office. I listened to it a few days later; it is indeed a very sad love song. What would he play for a special someone? With this question, he takes his time, leaning back against the chair and looking upward at the ceiling as he thinks. “I think I will do whatever she wants,” he said with a laugh. Pressed for more, he said after taking another minute, “If I could choose … it is a piece I play frequently. October from Tchaikovsky’s ‘The Seasons,’” describing it as a lonely and sad piece that makes your heart drop with the first line. Sunwoo concluded the interview with something that is a promise to his fans, as much as it is a promise to himself. “There will be times when I will be tired, emotionally drained. Musically, I will try not to fall into habit and not lose my love and passion for music. I will try to continue to have this feeling I have today. That is my small dream and wish,” he said. 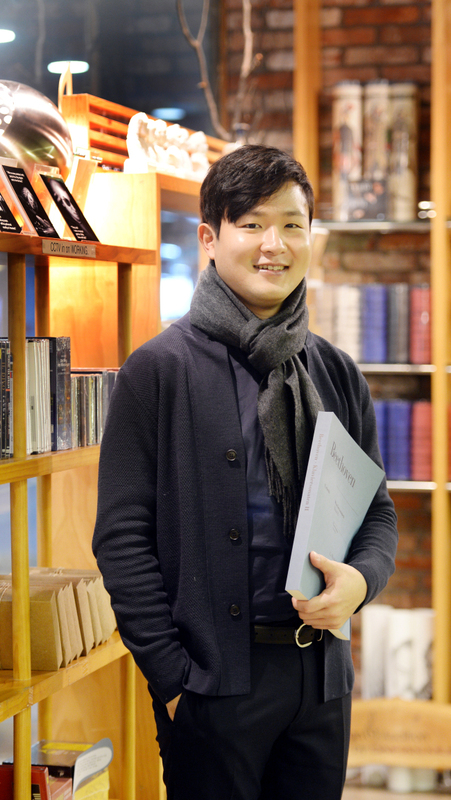 Sunwoo returns to Korea to perform Schubert’s Four Impromptus, D.935 and Brahms piano sonata No. 2 in F-sharp minor, Opus 2 at the Tongyeong International Music Festival on April 3.